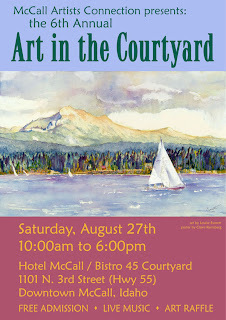 The 6th Annual Art in the Courtyard is this coming Saturday, August 27th in the Hotel McCall courtyard! The McCall Artist Connection has once again planned a fabulous showcase of local artists right out our front door! The event is open from 10:00am to 6:00pm with free admission, a raffle, and (of course!) amazing art! Stop into Rupert's before or after the show to round out a perfect summer day in McCall!